If you are the Oneplus one android smartphone user and want to enjoy the features of the Android 5.0 Lollipop on your device. here is the guide which will helps you to install the Android 5.0 Lollipop CM12 on your Flagship killer devcie. The rom is not official but works fine on any Oneplus one device. CM12 is still in active development and no one can except a clean ROM anytime soon, it will take at-least a month or two to take this ROM to the Stable Stage. If you want to try the lollipop experience on your phone then you have to must try this new CM 12 unofficial ROM on your phone. So make sure that you begin at your own risk as in this Article we will show you How to Install Android 5.0 Lollipop CM12 on OnePlus One. This is not an official release from anyone but a Custom ROM, you need to install a Custom Recovery on your device to install this and also your device must be rooted. Check out our guide here how to root and install Custom Recovery on Oneplus one. Step 1. Download the CM 12 zip file and Google apps package from the below mention link. Step 2. Now move both the zip files on you Oneplus one. Step 3. After this turn off your phone and boot in recover mode. TO do this Hold Volume down button + Power button. Step 5. Back-up your ROM using the Recovery. Perform a Back-up, Navigate to Back-up and Restore on Next screen, Choose Back-up again. Step 6. Now after this select Wipe and delete cache. Step 7. Select ‘choose zip from sd card’ from the Options. Step 8. 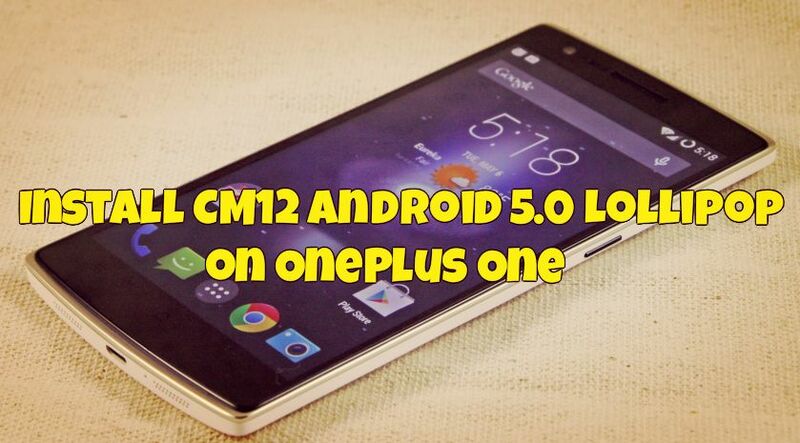 Select the CM12.zip file and confirm the installation on next screen. Step 11. Select Reboot Now to Reboot the System. Now you phone will reboot and running on the CM 12 Android 5.0 Lollipop ROM. Enjoy !